I just adore the Newton’s Donut Stamp Set. I decided to make a shaker card and wanted to make the donut sprinkles perfectly match the shaker bits. I cut out a card front at 4 ¼, 5 ½ and used a scallop circle die to cut out the window to the shaker. You can also use a circle, but I thought the scallop added a fun detail. I inked half the card front with Distress Oxide Ink in Picked Raspberry. I used the sentiment “Life is better with sprinkles” and stamped that to the bottom right of the card. Adhere a piece of acetate behind the card front and line the circle opening with one layer of foam tape, also add foam tape to cover the back. 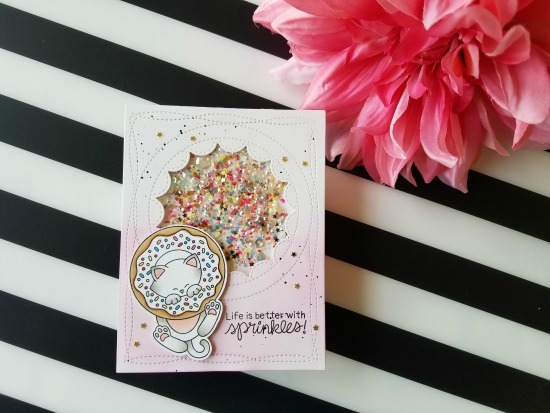 I used sequins and shaker bits to match my sprinkles which adds a fun element to the card. Adhere a 4 ¼ x 5 ½ paper to the back of the shaker mechanism to the foam tape. Adhere the shaker mechanism to a standard sized card base and then add the Newton Donut image to the left of the stamp sentiment. I always like added sparkle so I added a few black paint splatters along with mini gold stars to the card front. Hope you enjoy this fun shaker! oh this is soooooo CUTE. beautiful! I love the color scheme and as I always say, you cannot go wrong with a shaker card!